They use their intuition whether the exercises they perform suffice or not though there is one method which is more systematic and well organized. Using weight lifting charts is actually a good method to keep track the work out progress of body builders. In fact many professional personal trainers make a good use of the charts to guide their client into more effective and controlled training and exercises. With little knowledge of this simple chart, body builders can actually control their exercise into more controlled and well organized routine. What is usually recorded in weight lifting charts is the number of exercises that usually performed in a session. The simplest chart will provide columns and cells that will record the number of reps and weight that is lifted. There are some terms that should be understood before using this chart likes reps, 1RM and weight. For the beginning let us start with Repetitions or sometimes coined as reps. What you might think, repetition is the amount of repetition of one exercise. Next is 1RM, 1RM stands for one repetition maximum. This term is used to explain the maximum amount of weight one can lift in a single repetition for a particular exercise. In more complex mathematic formula, those terms are used in several occasions like in weight lifting competition. There are some formula that counts the maximum amount of weight and repetition of an individual. We will not move further to the application of the formula, rather, we will try to use simple chart for your routine training or exercises. The principle of weight lifting is to cause micro trauma to the muscle. It is a condition where tiny damage of the fibres occurs. Body will replaces the damaged tissue so that the next damage effect will be reduced. The use of the chart is to keep track at what point you keep your training, so in the following training you do not need to use intuition but just follow the record that you have made and you just need to add more weight to the training that you will perform. Therefore using weight lifting charts is a controlled and well organized method of muscle building. The advantage of using this chart other than keeping track of your training is giving you motivation. By recording your progress in the chart you will find the statistic of your training, you will think that you need to increase the amount of your training, the weight that you need to lift and other important statistics. Other than weight lifting charts there are also many other charts that will help your muscle building progress. There is also progress chart that will record the measurement of the body in specific part. Therefore using chart is highly recommended for body builders, if you cannot use it then try to ask personal trainer to help you explain the use of the chart. Well, firstly, you can find just as many people who say it’s not that important, as there are who say it is. So I haven’t got a clue who to believe. But form is just the way you lift and hold the weight to get the most out of the three types of muscle contraction, which are: concentric, isometric, and eccentric. Picture this: when you pick up your coffee mug and drink, that your bicep doing a concentric contraction. When you plonk it back down, that’s eccentric contraction. And when it just hovers by your mouth because it’s too hot, that’s isometric – or static – contraction. Now picture that you are doing the same with weights. You want to try and crow bar in all the contractions to get the most from the exercise. You want as many muscle fibres as possible to contract (they are like light switches; they either contract or don’t do anything at all). The more fibres you ’recruit’ to contract, the more stimulus your muscles get – so the more they’ll grow. So by concentrating on the three contractions you getting the most you can out of each rep. Circuit training workout involves intense and time-efficient exercises. It is made up of several exercise routines that are done with very minimal or no rest. It usually combines cardiovascular and strength training in one workout. In fact, the best circuit training workout is comprised of various strength exercises that target different muscle groups and cardiovascular activities aimed at increasing your heart rate. This workout can exercise all of the major muscles in your body within 20 minutes. This will require you to perform upper body and lower body exercises alternately without long resting periods in between. What you do is after working on your upper body, you rest those muscles while exercising your lower body at the same time. The circuit workout for your entire body will usually consist of squats, dead lifts, bench press, bent-over rows, overhead press and crunches. 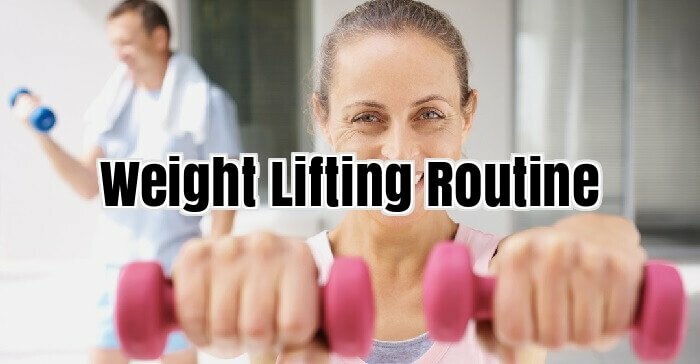 You do all these exercises quickly for about 20 seconds and move from one routine to the next. Once you have finished all the six exercises, you rest for a minute and repeat the circuit. Do this up to 4 times. As a tip, prepare your exercise machines or stations before starting with your routine so that you can perform efficiently. This type of circuit training combines cardiovascular and strength exercises to be performed alternately. You will need six stations for this workout consisting of lunges with overhead press, seated row, jump rope, dumbbell pullover, jog in place and high knee runs. In doing these exercises, you will be using both anaerobic and aerobic energies. Cardio exercises are performed 45 seconds while strength training for about 1 minute. Just like in the full body circuit, you rest for several minutes after doing the six routines continuously. There are many recommended ways that beginners in muscle building can grow their muscles quickly. But, all the methods being taught today can actually be deduced to simpler terms because most of them talk about the same thing. Their only difference is that they are presented in various ways. Here are three simple rules that beginning muscle builders can safely follow and be assured of the most effective results. Starters in body building are very eager and motivated to workout. Most of them really want to grow their muscles fast. Because of this, there is a tendency for them to overdo their body building routines. But, this is not the right way to do it. Bodybuilders must be very careful in their exercises because sudden muscular activity can cause stress and may lead to injuries. The perfect bodybuilding workout for beginners should start with manageable weights, repetitions and sets. As the muscles become used to weight lifting, additional weights can be used and more repetitions and sets can be performed. The common mistake most beginners in bodybuilders make is that they are so much into lifting weights that they oftentimes overlook the importance of obtaining the right nutrition. The problem with this approach is that the body does not get the right amount of fuel to keep going. You may think that because you can still carry weights then you still have enough energy stores in your body. Always remember that the amount of energy you have does not determine the type of nutrition you are getting. In weight lifting, your body needs a combination of nutrients to boost the energy and feed the muscles. Without having proper nutrition, you might end up shrinking your muscles instead of growing them. It is a common misconception that muscles are built only when they are worked out daily. The truth is rest is very crucial in muscle development. In fact, beginners in body building are only advised to exercise for a maximum of three times every week. They must always have a day off in their workout to ensure the recovery of their muscular tissues and eventually the growth of their muscles. Muscle development for beginners is quite common these days. It involves so many other things aside from just sculpting your muscles. It is about preparing and warming up your body before working out. It is also about getting enough rest from your workout. Moreover, it is about taking the supplements that your body needs. Whatever it is you do, if you are interested in muscle building, the balanced combination of diet and exercise is still the best and most simple rule for you to achieve the athletic body that you want. The proper workout for muscle building among beginners involves doing the right exercises. This means that you take a step by step process to a muscle building fitness regimen that will make your body gradually adjust to it. Once you are fully adjusted, you can increase the intensity of your workout. If you begin with difficult workout routines, there is a great chance for you to get injured. As a beginner, it is best for you to be careful in choosing the types of exercises that you allow yourself to do. Types of Exercises As a starter in muscle building, there are basic exercises that you can perform. If you are able to do these regularly and execute them properly, you will surely grow your muscles easily. Squat and dead lifts are the first two exercises that you can do. Bench press is the best resistance training workout for your chest as well as for your triceps and front deltoids. One of the best beginner exercises that can tone your arms, shoulders and triceps quickly and effectively is the military press. Deciding on a Trainer There are many online guides available that you can use as you start your body building regimen. You can save money by doing this. However, you can also opt to enrol in a gym and get a good fitness trainer that will guide you in your workout. Body building may seem to be an easy task but it can sometimes require assistance. Decide what is best for you and choose accordingly. 1. Put together a plan that works out the biceps and back in the same schedule. The reason for this is that back exercises develop the back muscles and biceps at the same time. 2. Another set of muscles that you must exercise together are your chest, shoulder and triceps. Chest and shoulder exercises promote the growth of the triceps. 3. The muscle groups in both items above should comprise your upper body exercises. Another set of workout plan should be made for your lower body. 4. Your lower body exercises must target your quads, hamstring and calves. Make a plan to exercise these muscles. 5. After grouping your muscles together in your weight lifting workout plan, incorporate a schedule for your exercises. It is recommended that you perform intensive exercises at a maximum of three days every week. 6. Alternate your weight lifting exercises with aerobic exercises. 7. Schedule a rest day once a week to give your muscles time to rest and rejuvenate for another week long workout schedule. Without rest, your muscles will not grow. 8. Include your abdominal exercises in your lower body workout schedule. 9. Perform 5 sets of one type of exercise as a beginner. Do 12 repetitions in the first set, 10 in the second, 8 in the third and 6 in the fourth set. 10. While you decrease your repetitions for each set, increase the amount of weights you use. 11. Before proceeding to the last set, rest for about one minute. 12. For your fifth set, decrease the weights and perform 12 repetitions. 13. After the last set, perform 12 counts of another type of exercise for the same group of muscles. 14. Perform number 12 and 13 without taking a break. 15. Once you have finished exercising one group of your muscles, take a 2 minute break before moving on to the next exercise. A lot of men, both skinny and big want to build muscles. But, most recommendations for muscle building are very general that it confuses men with different sizes on what to follow. Here are some basic tips on muscle development specifically designed for men with lean body structures. If you are skinny, you may have the urge to spend so much time in the gym thinking that this will give you the muscle mass that you want. However, this is not advisable for you. In fact, you are recommended to only work out a major group of muscles once every week. Work hard every time you workout and let the muscles regenerate until your session in the coming week. You can spend one time for your chest muscles and another day for your quadriceps. Just remember to work on one main muscle group weekly. This is essential in developing bigger muscles. Compound exercises work on more than one group of muscles. A good example is bench press which exercises both your triceps and pectoral muscles. Pull ups is another exercise that work on your latissimus and biceps. If you are skinny, this may mean that you have a fast metabolism. Because of this, you burn calories at an increased rate so you have to eat more in order for you to have extra nutrients for your muscles to use for growth. This does not mean however that you eat anything you want. You still have to choose the nutritious ones so that you can have a well balanced meal. Make sure to include carbohydrates, healthy fats and most of all protein in your diet. Muscles can only grow when you rest. Thus, it is important for you to sleep at least 8 hours every day if you want your muscles to fully recover. Being a skinny guy specifically makes you more prone to training so much which makes rest even more essential. If you do not get plenty of sleep, you can get easily injured and your muscle building efforts will be of no use. Bigger and stronger muscles are only possible with plenty amounts of rest.